VIDEO: Ryan Seacrest Talks About His “American Success Story”! Most people are very well aware of radio and TV host, Ryan Seacrest‘s huge successes. With experience on American Idol, radio, reality shows and a clothing line with Macy’s, this successful guy has much to be proud of. 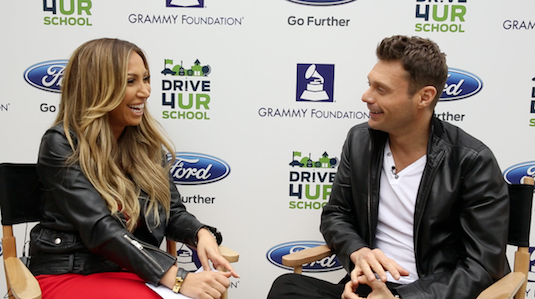 Recently, Ryan sat down with The Lowdown’s Diana Madison at Diamond Bar High School to talk about The Grammys Foundation and Ford’s effort to help honor music programs in schools along with what he wishes his legacy to become. Basically his “American Success Story”. Check out the entire interview in the video below! Nick Jonas Performs “Jealous” Live On ‘On Air With Ryan Seacrest’ & Plays Crotchball! This morning, Nick Jonas visited the studios of Ryan Seacrest to appear on his radio show On Air With Ryan Seacrest. During Nick’s guest appearance, Nick played a live acoustic version of his hit single “Jealous.” However, Nick also had a bit of fun in the studio when he played a game of crotchball with Ryan. In the game, Nick had a hoop attached to his waist and Ryan had to throw a ball through it. If he missed, Nick had to perform a dare. Be sure to check out Nick performing “Jealous” live and playing crotchball by watching the videos below and let us know what you think by commenting! Taylor Swift Dresses Up As Pegacorn For Halloween 2014 On The Elvis Duran Show – Pics Here! Be sure to check out more pics of Taylor from the radio show in the gallery below and let us know what you think by commenting! Taylor Swift Chats With Ryan Seacrest On ‘On Air With Ryan Seacrest’ – Watch Here! Be sure to check out Taylor’s interview with Ryan Seacrest by watching the videos below and catch what Taylor had to say! Ariana Grande Spotted Leaving NRJ Radio Studios In Paris – Pics Here! Ariana Grande was spotted leaving NRJ radio studios in Paris, France on October 14th. Ariana looked beautiful in black and even took time to stop to talk to fans, take photos and sign autographs. Rita Ora & Iggy Azalea Looking Fabulous At KISS FM’s Studio — See The Pics! Popular music artists Rita Ora and Iggy Azalea visited KISS FM’s studio in London, England on September 18th to chat it up with Melvin O’Doom and Ricky Haywood Williams. Don’t worry if you feel like you missed something because the interview with these beautiful ladies will be broadcasted over the airwaves on KISS Breakfast between 6 am – 9 am tomorrow, September 19th. See more pics of Iggy and Rita below. Demi Lovato Chats With ‘Radio’ About Music, Touring & Her Goals! How do you keep the tour fresh for yourself and your fans? Every night is different because I’m in a new city and performing in front of a new crowd. Compared to my Neon Lights Tour, which wrapped earlier this year, fans can expect a few more surprises during my World Tour as well as special guests Christina Perri, MKTO and Becky G.
I’ve been fortunate enough to have an amazing crowd at every show. The energy definitely affects my performances in a positive way – there’s no better feeling than performing in front of an audience and seeing my fans singing my songs with me. What are your top three favorite Demi Lovato songs? Do they change depending on whether you are performing currently? What is going through your head as you perform? For me, it’s about connecting with my audience, focusing on the music and putting on a great show for my fans. I am reading a great book called Within: A Spiritual Awakening to Love and Weight Loss [by Dr. Habib Sadeghi with a forward by Gwyneth Paltrow] right now. What songs are catching your ear? “Stay With Me” by Sam Smith is currently one of my favorites. When you’ve achieved so many things, how hard is it to set goals? It’s not hard at all. There are still many goals I want to achieve. I would love to win a GRAMMY one day, maybe even an Oscar. Another goal of mine is to continuously improve myself every day and become a better person than I was yesterday. Every day is a blessing and I am so grateful for all of the amazing moments. When I look back on how far I’ve come, it does seem surreal – but more than anything, I’m honored to be in the position where I can help others. You’ve grown up in front of the camera, what are some of your tricks to surviving public scrutiny? Over the last couple of years, I’ve learned that other people’s opinions of me really don’t matter. Right now, I’m focusing on making myself happy and becoming a better person every day. Staying positive and staying strong.